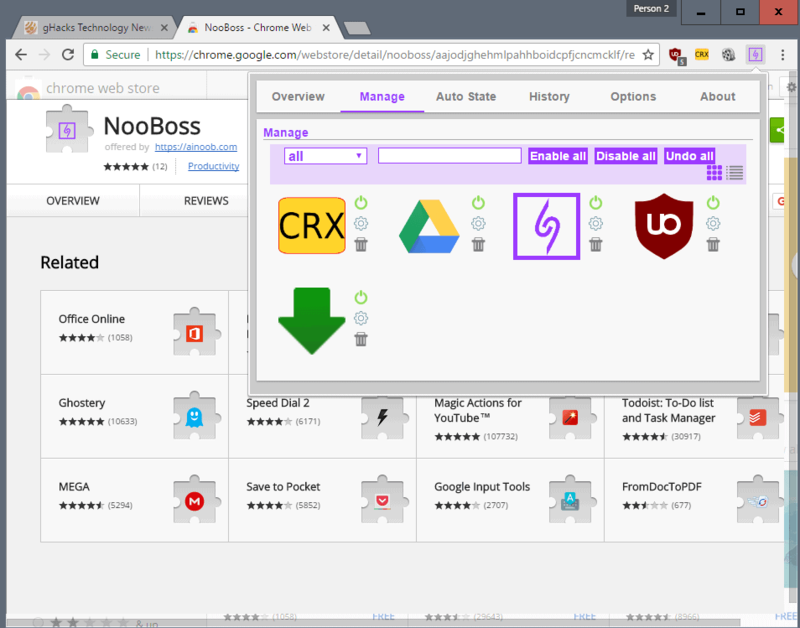 NooBoss is a Google Chrome extension management add-on that supports automatic state changes, a history, and better management options among other things. This includes monitoring extensions for state changes, activating extensions only for select sites, checking the update history of extensions, and basic management options to activate, remove or configure Chrome extensions. Chrome itself offers only basic options when it comes to extensions installed in the browser. You may change their state (enable, disable, remove), check background pages, look at the permissions the extension requires, and allow it to run in Incognito mode, and to access file URLs. While the current version is displayed on chrome://extensions/, there is no update history, no information when extension state change, and no option to allow extensions to run only on select websites. NooBoss for Chrome changes this by supporting all that. 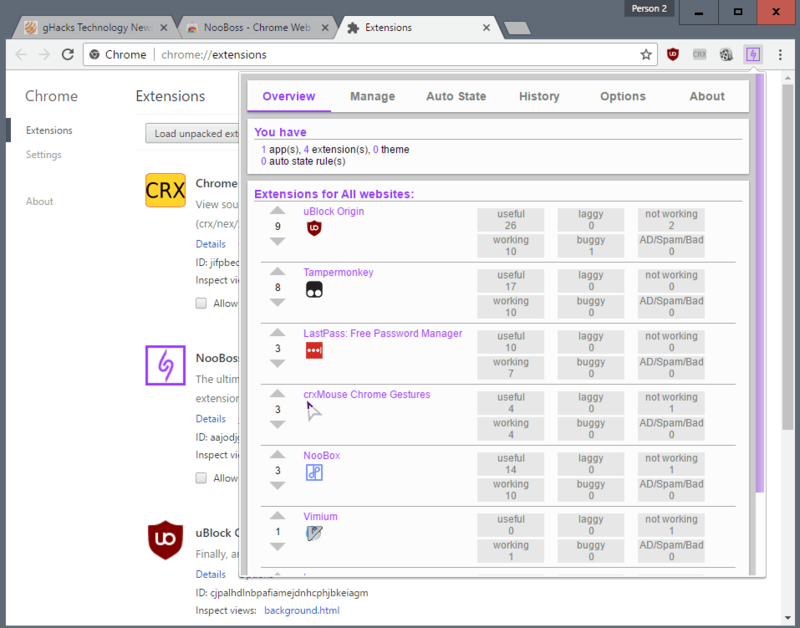 The extension adds an icon to Chrome's main toolbar after installation that you click on to manage extensions. Note: The extension does not show advertisement by default, but you join the community automatically. You can leave the community on the options page. Being in the community sends usage statistics and information about installed extensions to the author. The extension opens the overview page on click that lists the number of apps, extensions and themes that are installed, and the number of auto state rules. There you find the option to enable the extension suggestion feature.. NooBoos needs permissions to read the browsing history for that. The author of the extension suggests that you check out its source code, which is available, to verify that it is not doing anything shady with that privilege. You can use the extension without doing so however. Extensions for "all websites", and extensions for the particular website are listed as suggestions once you make the change. You get user tags listed on that page (useful, working, not working, buggy, laggy, and AD/Spam/Bad). The manage tab lists all installed extensions. It features a search at the top, but that is only useful if you have installed quite a few extensions in the web browser. You may switch to list view mode to improve visibility, and enable or disable all extensions with a click on the buttons. While you may use these buttons, you may also enable or disable extensions individually, trash them, or open the settings if they offer them. The functionality of the Auto State tab becomes available once you enable it under options. It allows you to enable extensions only on select sites, or disable extensions on certain sites automatically. This can be useful if an extension is incompatible with a site, or if it changes how the site works in a way that it breaks site functionality. The only enable blocks the extension from being enabled on sites unless it matches what you have whitelisted. NooBoss ships with a history that lists when extensions get installed, disabled or removed, and when states change. The options finally provide you with options to manage notifications. 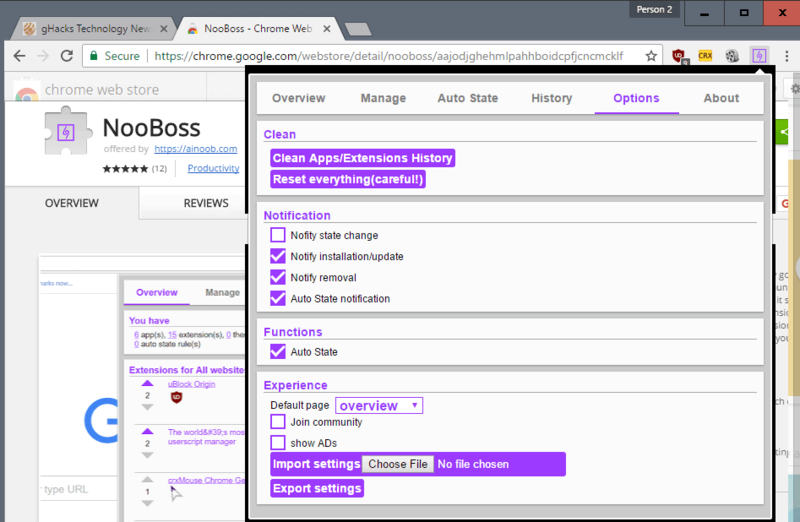 NooBoss informs you when extensions are updated or installed, removed, and when the extension's auto state feature kicks in. You may also enable notification on extension state changes on top of that. You find options to leave the community, and to enable ads there as well. Last but not least, you may change the default page that opens when you click on the extension icon, export or import settings, reset the app, or clean the apps and extension history. 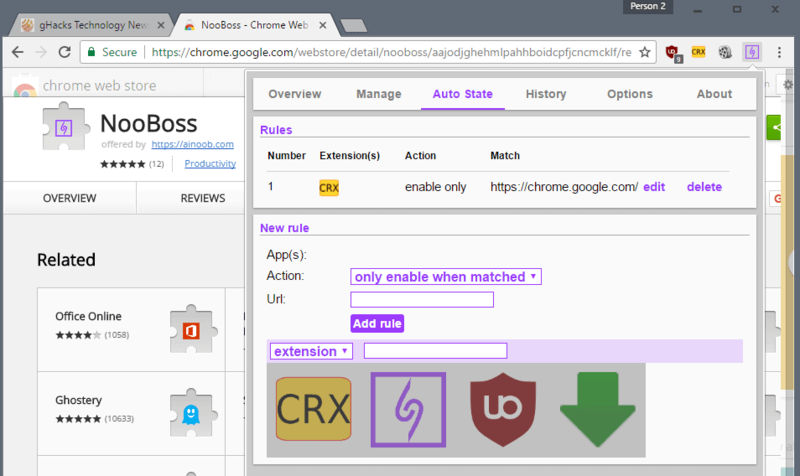 NooBoss is a well designed extension for Google Chrome that improves the browser's capabilities when it comes to extensions significantly. There are a couple of things the extension does not do right now. Options to block updates, view background pages, and enable error collecting and Incognito mode are missing. Now You: How do you manage extensions? I can’t see comments while in mobile UI. Can you look this? John, we are aware of this, and hope to have a solution soon.